PARIS - I won't let you down like Lance Armstrong. This Tour de France champion is for real. That, in so many words, is the promise Chris Froome made as the newest winner of cycling's showcase race so badly hurt over the years by riders who doped to win it. Because of their deceit, Froome faced a barrage of questions as he dominated rivals over three weeks of racing, all centred on the same key concern: Can we believe in you? Yes, he insisted. The sport is changing, he argued. He handled the scrutiny politely and adroitly. He said he understood the skepticism. And on the podium in Paris, his wiry frame wrapped in his canary yellow jersey, Froome asked the guardians of the 110-year-old race and all those who love it to trust him. "This is one yellow jersey that will stand the test of time," he said. In two years, Britain has had two different winners: Bradley Wiggins in 2012 and now Froome, a cooler, calmer, more understated but no less determined character than his Sky teammate with famous sideburns. Froome rode into Paris in style: Riders pedaled up to him to offer congratulations; he sipped from a flute of champagne; a Tour organizer stuck an arm from his car window to shake Froome's hand. He dedicated his victory to his late mother, Jane, who died in 2008. "Without her encouragement to follow my dreams I would probably be at home watching on TV," he said. Froome took the race lead on Stage 8 in the Pyrenees, never relinquished it and vigorously fended off rivals whose concerted challenges turned this 100th Tour into a thriller. Froome and his Sky teammates linked arms as they rode for the line. "This is a beautiful country with the finest annual sporting event on the planet. To win the 100th edition is an honour beyond any I've dreamed," he said. Five-time winners Eddy Merckx, Bernard Hinault and Miguel Indurain joined Froome on the podium. Missing, of course, was Armstrong. Stripping the serial doper of his seven wins tore a hole in the Tour's roll of honour as large as that left by World War II, when the race didn't take place from 1940-46. None of the 100th edition's podium finishers — Froome, Nairo Quintana and Joaquim Rodriguez — have ever failed a drug test or been directly implicated in any of cycling's litany of doping scandals. That is an encouraging and notable departure both from the Armstrong era and many other Tour podiums before and since. "In a way, I'm glad that I've had to face those questions. That after all the revelations last year and just the tarnished history over the last decade, all that's been channeled toward me now," Froome said. "I feel I've been able to deal with it reasonably well throughout this Tour, and hopefully that's sent a strong message to the cycling world that the sport has changed — and it really has." "The peloton's standing together, the riders are united and it's not going to be accepted anymore." The spectacular nighttime ceremonies, with the Eiffel Tower in glittering lights and the Arc de Triomphe used as a screen for a flashing lightshow, capped what has been a visually stunning Tour. It started with a first-ever swing through Corsica, France's so-called "island of beauty," before veering through the Pyrenees to Brittany and then across France to the race's crescendo in the Alps — 3,404 grueling kilometres (2,115 miles) in total. Because of the unique late-afternoon start for the final Stage 21, the riders raced on the cobbles of the Champs-Elysees as the sun cast golden hues over the peloton and shadows lengthened over the dense, cheering crowds. Marcel Kittel won the final sprint on the avenue, the German's sprinter's fourth stage win of this Tour. French Air Force jets in formation trailed red, white and blue smoke in the skies. The riders circled like a necklace around the Arc de Triomphe in their bright colored team jerseys. Before the pace picked up sharply on the Champs-Elysees, Sunday's 133-kilometre ride was largely leisurely. The 169 finishers — from 198 who started — savored the pleasure of surviving the three-week ordeal. Ryder Hesjedal of Victoria topped the Canadian contingent with a 70th-place finish overall. Tour rookies David Veilleux of Cap-Rouge, Que., finished 123rd while Svein Tuft of Langley, B.C., was last in 169th. "We are very proud of these three Canadian riders at the Tour de France," said Jacques Landry, head coach at Cycling Canada. "Crossing the finish line of the Tour de France is a remarkable feat, and we should all be proud of them." Quintana, the 23-year-old Colombian who secured second place behind Froome with an impressive win on Saturday's penultimate Stage 20, laughed as third-placed Rodriguez tried to spark up a cigar in the saddle. 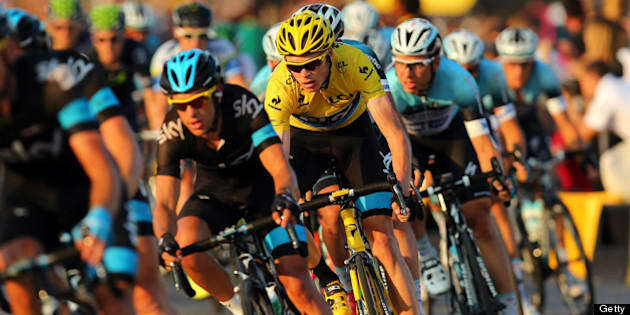 Froome's clear physical superiority made him overwhelming favourite going into the Tour and carried him through it. His winning margin of 4 minutes, 20 seconds was the largest since 1997, when Jan Ullrich — who has since admitted to doping — beat Richard Virenque — who also confessed to using performance-enhancers — by 9 minutes, 9 seconds. Armstrong had larger margins of victory than Froome but those no longer count. Froome's three stage victories — in the Pyrenees, on Mont Ventoux in Provence and in a mountainous time trial — were the most for a Tour winner since Armstrong got five in 2004, results now annulled. Sky team manager Dave Brailsford said the Tour is seeing "a new generation" of young riders who "have never lived in an era of doping." Cycling's future "is in good hands with Chris, because he is an exceptional rider and an exceptional character." Unlike some other riders who cut short questions about doping and bristled, Froome said he was happy during the Tour to discuss the issue that has so poisoned his sport. He said he, too, felt let down by his cheating predecessors. Froome argued that his success demonstrates that cycling's anti-doping system — now among the most rigorous, invasive and sustained of any sport — must be working, because otherwise he wouldn't be able to win. With few exceptions, including the absent Giro d'Italia winner Vincenzo Nibali and Wiggins, the cream of cycling's grand tour riders raced in the 100th edition. That Froome beat them so handily suggests he'll again be the overwhelming favourite in 2014 — in the 101st Tour that starts in Leeds, northern England. AP Sports Writer Jerome Pugmire and Associated Press Writer Jamey Keaten in Paris contributed to this report.